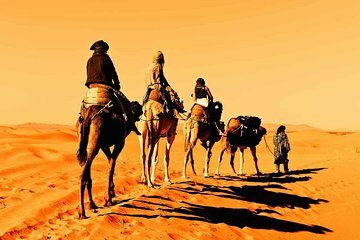 Make your way to Fez from Marrakech by journeying across the Merzouga Desert on this private, 4-day tour, including three nights of accommodation and all transport. Ride through Erg Chebbi on a camel’s back, spend a night in a Berber tent, and visit kasbahs, such as the UNESCO-listed Aït Benhaddou Kasbah. See Atlas Film Studios, and be surrounded by an oasis of palm trees at Palmeraie and Tafilalet palm groves. Sip on traditional Moroccan mint tea at Khamlia, and spot Barbary apes while travelling through the Middle Atlas cedar forests. This private tour is definitely the way to get from Marrakesh to Fes. It was one part awesome road trip, one part cultural exchange, one part intensive french lesson. Abdul made this all possible. As you're sitting in his super comfortable SUV watching the incredible landscape change from desert to alpine, you'll be talking about Morocco and it's people and listening to traditional Berber music and Arab pop songs. Abdul speaks perfect English and French but as in my case, will patiently allow you to practice French with him. Abdul also impressed me with how hard he was working to make sure I was well taken care of. When I commented on this, his response was, It's just my nature to do so.